OK folks, I only got one MORE LOVE t-shirt picture this week and so I need you to take out those cameras and start clicking! Above is one of my lovely students. She's been with me for 4 years of high school. She is an absolute angel with my kids and she volunteered to babysit them the day we held our garage sale. 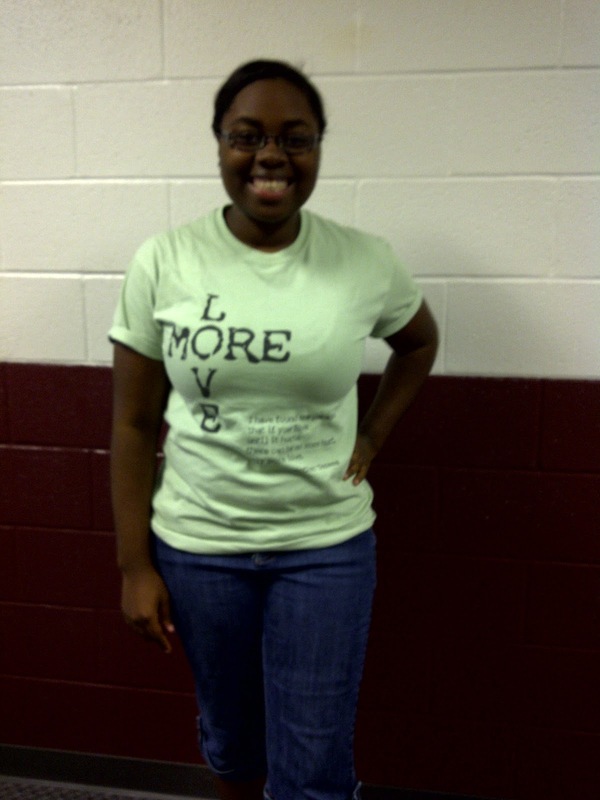 She really understands what the MORE LOVE shirts are all about. And I think that Grace is really starting to understand, too. Every night she prays for her sisters. Yesterday in the bathtub she said in a sad little voice that she was really missing her sisters a lot. And then tonight she was studying the MORE LOVE shirt that I was wearing and said "We should send a MORE LOVE t-shirt to Mama J (Haven, Manny, and JoJo's foster mother) and then she will send us our sisters soon." What a little sweetie. She has seen lots of pictures of Mama J with the boys and she knows that at least in our family, that is where Congo babies come from. So say a little prayer tonight for Grace and her sisters. Pray that they will be together soon and that we can hand deliver that t-shirt to Mama J with a special thank you note from Grace!